New York's walls can sleep soundly at night knowing there's a giant, hand-painted Batman out there keeping them safe. 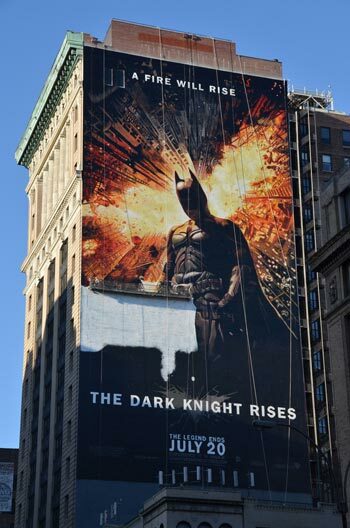 If you happen to live in New York and have somehow remained unaware of the impending arrival of the The Dark Knight Rises in theaters, an ad company has quite helpfully painted a 150-foot tall version of the film's poster on the side of a building on Park Avenue South. Really. Painted. By hand. The famous ad spot is one of a handful that features traditional mural advertisements. The ads are painted directly onto the wall by hand and usually stay up for a mere six weeks before being painted over with an advertisement for the next big blockbuster. Irene Gallo, an art director who works in a nearby building, met with Dan Cohen, one of the mural painters, and got him to explain how the painting process works. A wall-sized rendition of the artwork is broken down into a simple outline, the spaces are punched out, and the artists are left with what is essentially a giant stencil. Once the basic design has been sketched onto the wall using a charcoal pounce, a small team of painters begins filling out and blending the mural's colors by hand. It took a four man team around five days of work to complete The Dark Knight Rises ad. When asked if he had any regrets about painting over his work every six weeks, Cohen said no. "After so many years it doesn't affect me anymore," he elaborated. "Plus, it's a great way to get over the preciousness of my work! I do have favorites: Clash of the Titans, Inception, Wrath of the Titans, Terminator, Iron Man, Transformers, Spider-Man 2, to name a few." Now all we need is for Banksy to stencil a bucket onto Batman's head or something.